Because this release is rather special, I have been reviewing Big Finish since October 2013 and this is one of the very best I have had the honour to listen to it really has everything – its a part sequel to the series 06 story arc involving Kovarian’s attempt to assassinate The Doctor at Lake Silencio, its an almost traditional Doctor Who story with a mystery to solve in historical times, its a surreal almost Lynchian take on “timey-wimey” involving multiple courses at an an exclusive restaurant and its a reminder that time must always stay on its course and that a fixed point is a fixed point. Intrigued? Well read on. I make no secret that I adore River Song – I am as far from a Moffat cheerleader as you could possibly get but she is a wonderful character with so many layers – on the surface she seems confident, glamorous, flirtatious and tough but underneath there is the little girl stolen away from her parents and raised by a monster to become a killer – River is a complicated space/time event, she is also The Doctor’s wife (though not all of the Doctor’s incarnations know it) and this time she joins up with The Fifth Doctor (Peter Davison) and his companion Brooke (Joanna Horton), but more on her later…. So imagine that there is a place called Terminus Prime where you can choose the nature of your demise be it heroic, fantastical or just plain daft – shouldn’t get a lot of repeat custom should it? But unfortunately River has access to the galactic Club-card database and has realised that several people make several journeys there and that these several people all had something in common – Demos Run. It starts as a bit of a light farce, what with employees called Kevin dressed as Death from the Seventh Seal but having to keep their name badge on and ends in abject heartbreak for River – this is the sort of drama that turns from one to another on the head of a pin, Neve Fountain is such a skilled writer one moment satirising the tedium of corporate protocol the next pulling the rug out from under you doing something which is far too spoilery to discuss. Alex Kingston hits the ground running as River, but also plaudits to Ian Cunningham as Kevin and Sophia Carr-Gomm as Lily. How did Mozart die, was he murdered after he finished composing his requiem? The Doctor )peter Davison), River and Brooke (Joanna Horton) are in Vienna to try to find out – River is her usual flirty, intellectual, confident self around Five and he seems a bit bothered and bewildered by her familiarity all stiff upper lip and english whilst Brooke doesn’t seem to like her at all, in fact she is downright jealous of her relationship and seeming familiarity with HER Doctor – set to the backdrop of a mystery to find a killer and prevent it literally going viral is this game of one upmanship, of carefully calculated chess between River and Brooke with the Doctor seemingly oblivious but probably knowing what is going on all along. A triumph of plotting and pacing acted to perfection. Ok, forget everything that has gone before, forget “timey-wimey” this takes it to a whole new level – hold on to your chronometers because you aint seen nothing yet! The Bumptious Gastropod is an exclusive restaurant outside the normal rules of causality – and it is here that The Doctor dies, it is here that Madam Kovarian (Frances Barber) has established a new fixers point in time to ensure that it does happen. 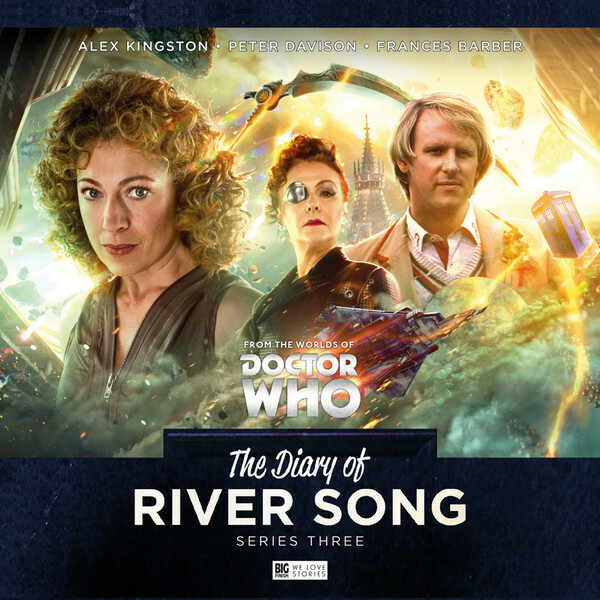 It is also here that several versions of River, The Fifth Doctor, a very bemused man called Andrew and a very knowledgable Maitre D’ make their marks on the story. Its upside down, its back to front, its almost farce like in its presentation and it is truly a wonderful piece of writing everything just sort of dovetails together quite nicely – it does require active listening but it is incredibly rewarding. And so the end with tales of Furies haunting the mind of Madam Kovarian (Frances Barber) and memories of the childhood she lost haunting River, with causality collapsing and new powers making their play in this brave new Universe can a crime committed be put right? Is the life of one innocent worth, well everything? Its deep dark and stirring stuff and left me with a feeling of unease at the resolution, its very River but certainly not very Doctor. Our two leading ladies Alex Kingston and Frances Barber verbally spar, chew the scenery, spit venom and bristle with rage – their scenes are just so visual and the reprise of the “tick tock goes the clock” motif from series six adds a sinister and melancholy edge to proceedings. Not how I would have wanted it to end, not how the Doctor would have wanted it to end but the only way it could end and bravo Matt Fitton for ending it that way. And that is that (until the next series in August featuring Sir Tom Baker no less) and what an epic box set, but also what an intimate exploration of the darker recesses of River’s mind and her all consuming love for the being we know only as The Doctor, her love is all encompassing and sometimes The Doctor doesn’t even know who she is – thats River’s tragedy and what drives her onwards. I cannot recommend this box set enough, even if you ever not that keen on River on TV give this a go and you will be pleasantly surprised by her depth of character. I sign off on my last review by awarding 10/10 and also would like to end with a song which I find very River-esque. Thanks all. Alex Kingston (River Song), Frances Barber (Madame Kovarian), Peter Davison(The Doctor), Ian Conningham (Kevin / Rindle), Julia Hills (Sharon / Rindle), David Seddon (Mr Quisling / Tarn 2), Leighton Pugh (Lake 2 / Dave / Tarn), Sophia Carr-Gomm (Lily), Joanna Horton (Brooke), Issy Van Randwyck (Giulia), Rosanna Miles (Antoinette / Maid / Constanze), Teddy Kempner (Viktor / Mozart / Stefan / Apothecary), Jonathan Coote (Maitre D’ / Chef / Assassin), Nina Toussaint-White (Brooke 2), Francesca Zoutewelle (H-One / H-Two / Mission Captain), Pippa Bennett-Warner (O / The Deterrent). Other parts played by members of the cast.